Mutiny on high seas! 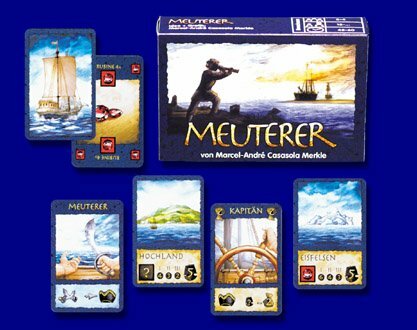 Everyone has signed onto the Merchant Ship to earn as many Victory Points as possible by selling their wares. The Merchant gets the best price in a trade and the Loading-clerk can choose his new wares. The Mutineer however has some other ideas: together with the Ship's Boy he'll try to overthrow the Captain. On the other hand the Captain tries to keep in control and hopes the Boatswain will help him. Goal: The players try to sell their wares at the best price to earn Victory Points. If feels like a board game in card game format - makes it great for bringing along anywhere. This is a small card game - no larger than a standard deck of cards, but it packs a huge punch! The mechanics are deep, complex and well integrated with the theme while the game is still simple enough to be picked up by newcomers quickly.